Since the inception of photography, the landscape has largely been a genre concerned with the contemplation of sublime nature. By the late twentieth century, however, the seismic effects wrought by industry demanded a new vision. For the last twenty years this has been the artistic concern of photographer Edward Burtynsky. Burtynsky characterizes his theme as, "the landscape changed in the pursuit of progress". Working with a large-format view camera, Burtynsky has journeyed from the mines of Sudbury to the marble quarries of Italy. 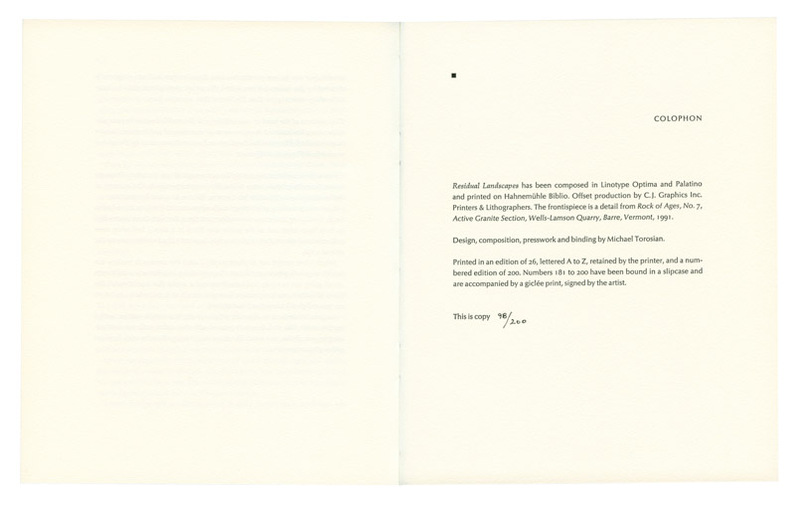 And what he found in the aftermath of the extraction of resources, the effluence of industry and the reclamation of materials was the "residual landscape", a poetic document embedded with metaphors for architecture, archeology and art. Residual Landscapes presents a portfolio of twenty-four photographs accompanied by an interview conducted by Michael Torosian. 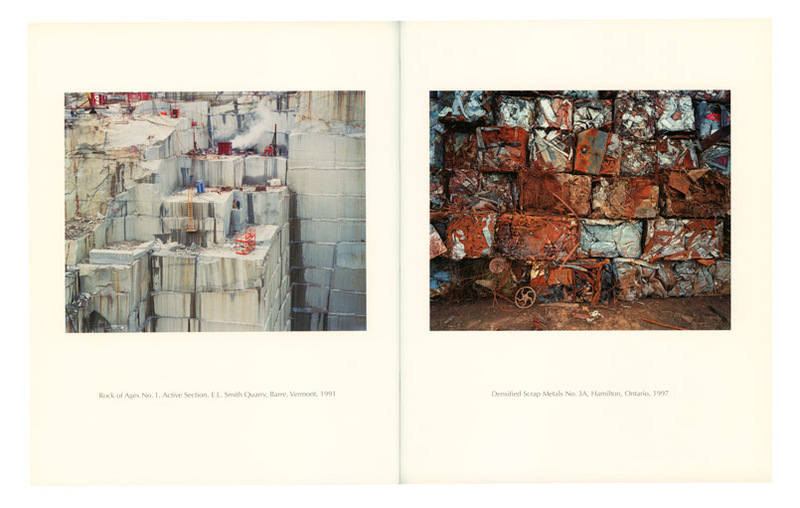 Edward Burtynsky's work is in a number of public collections including: Albright-Knox Art Gallery, Buffalo; Art Gallery of Ontario, Toronto; Canadian Centre for Architecture, Montreal; Museum of Fine Arts, Houston; and the Los Angeles County Museum of Art. 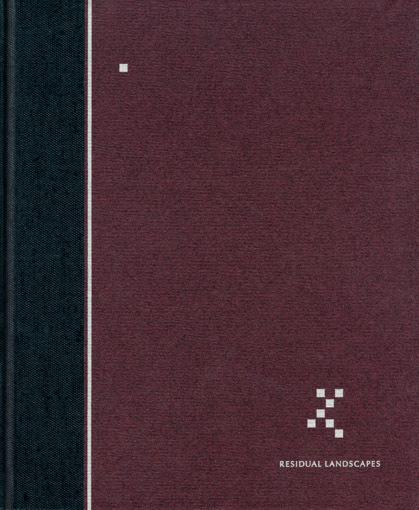 Twenty copies of Residual Landscapes have been set aside for inclusion in a special edition. 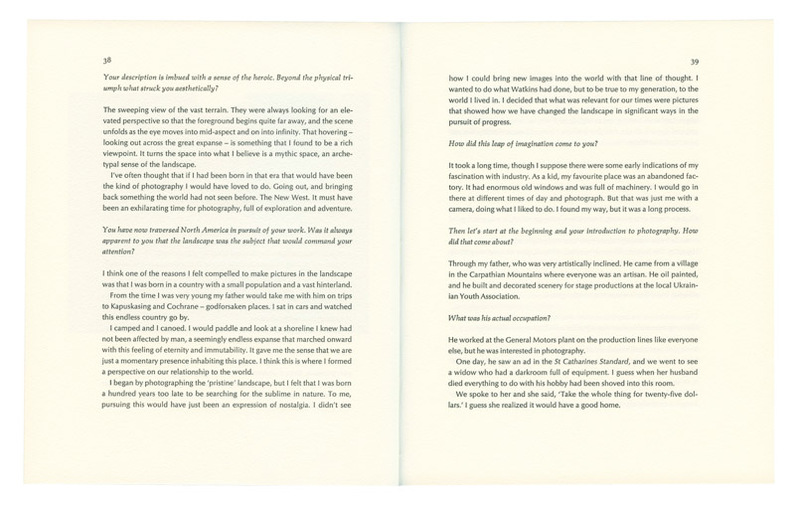 Each book is accompanied by a full colour Giclée print on Arches paper of the photograph Rock of Ages No. 4, Abandoned Section, Adam -Pirie Quarry, Barre, Vermont, 1991, signed by the artist and presented in a folio. Book and folio are housed in a slipcase.